Shown above are (l-r): Grantsburg School District Superintendent Joni Burgin, Bill Morrin, Dana Morrin, and Rotary President Mark Anderson. Dana Morrin named "Teacher of the Year"
The Grantsburg Rotary Club honored Dana Morrin as Teacher of the Year at their meeting on June 19. Dana has taught for 36 years, serving as Title I reading director for the district. She graduated from the UW-Stevens Point with a degree in Elementary Education and she received her Master's Degree at UW-Superior. She began her career in Cozy Corner, then moved to the Webster Elementary School before being hired in Grantsburg in 1991.She has served on many school committees, organized the after school reading program at the Library, and holds an annual Christmas Reading Challenge for the students. In addition, she promotes reading through the Dr. Seuss books. Dana also has served for many years as a volleyball coach. She and her husband Bill, who is retiring this year as Middle School Principal, have three children. Several Grantsburg Rotarians helped organize a drive to plant 15 new maples trees in the Riverside Cemetery in Grantsburg. Storms in the past few years have caused the loss of many old trees. Donors came up with funds to help replace many and this group of Rotarians helped spearhead the project. Show are (l-r) Dave Huff, Roger Inouye, Peter Johnson, Stan Peer, and Gordy Lewis. The trees were planted on May 22. If you use Facebook you'll want to keep up with happenings of the Grantsburg Rotary Club on the new Facebook page. Go to "Grantsburg Rotary" and "like" the page. You will then be informed when any changes or additions are made. It's a good quick way to keep up with what's happening. Mike was born in Rochester, Minnesota and attended from John Marshall High School and Rochester Community College. Grantsburg High School students, and teacher chaperones, will be spending 11 days in Costa Rica in March as part of a student exchange study tour. A group of students from Costa Rica will be in Grantsburg in January as part of the program. Shown above (front row, l-r),Kate Weiss, McKenzie Rombach, Luke Trittelwitz, Alexis Troff, Hannah Smestad, and Mrs. Katie Johnson. Back row: Mr. Matt Berg, Olivia Ohnstad, Jadyn Watt, Jillian Seeger, Seth Schlecht, Katelyn Meier, and Shilo Covey. Grantsburg High School students and families are hosting a group of students from Costa Rica and their teacher chaperones. 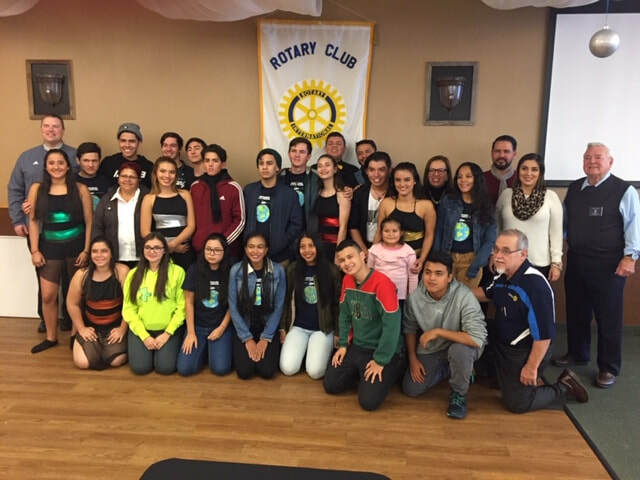 The group visited the Rotary meeting on January 22 and several performed dance routines as entertainment. The "warm weather" students are enjoying the Wisconsin cold with outings that have included ice skating and tubing down a snow-covered hill. 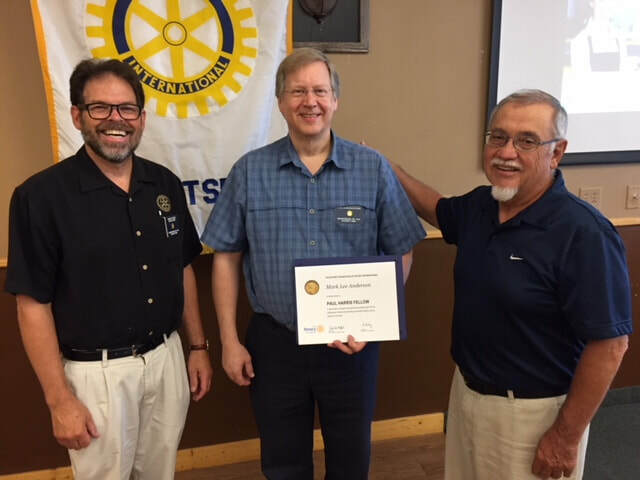 Outgoing Club President Mark Anderson receive Paul Harris Fellow honors at the meeting on July 17. Greg Peer and President Roger Inouye made the presentation. Mark serves as general manager of Grantsburg Telcom and joined Rotary in 2014. Two GHS seniors have been named as Grantsburg Rotary's Students of the Month. Read more about the honored students on the Rotary News page. Jim has been a member of the Grantsburg Rotary Club since 2010. Read more on the Rotary News page.